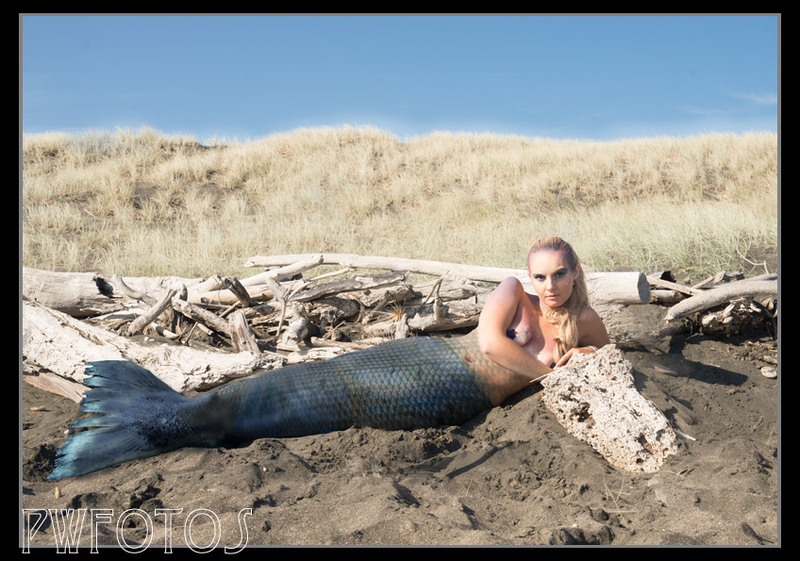 The second shoot in the “Once Upon A Time” series called for a mermaid and was originally envisaged to be on the rocks on the south coast. This ended up being changed when I was approached by Peri who lived in New Plymouth who was very keen to take part in the shoot. She even offered to drag in 19her friend Ella (who is a very talented makeup artist). They were willing to drive the 4 hours down to Wellington, but when I told them that I was going to be in Wanganui on the weekend of March 2-3 they were happy not to have to travel so far and we arranged to meet and do the shoot there. Now shooting away from home base always presents issues as you need to ensure that you don’t leave anything behind. It is also complicated when you don’t know the locations that may be available. The former is sorted through careful planning while Facebook can come to your aid with the later. On a photographic Facebook group I asked for ideas and was told roughly where to look, so on the Saturday I set off to look at the suggested beaches. The first location was not promising especially with two drunks sprawled out on the sand, but further along the road we found the exact location I was looking for. The only problem was that the gear all had to be lugged over a very large sanddune. The next day we met up with Peri and Ella and headed for the beach. Unfortunately when we got there we discovered that the “ideal” spot was being used by a couple of fishermen. Fortunately a 100m down the beach was another suitable location. So after Ella finished with the makeup we headed down there. I had anticipated sun as an issue but what turned out to be a bigger one was wind. Although it was not that strong it threatened to turn the reflector into a kite making it very difficult to use. Still I managed to get the shots that I wanted and a few more. A friend is a keen fishermen so getting a good image of a fish was not that difficult. Several hours of photoshop work and we have a couple of images that are not too bad. It’s really a great and useful piece of info. I am glad that you simply shared this helpful information with us. Please keep us up to date like this. Thanks for sharing. actual post extraordinary. Magnificent job!